10/29 (Thurs) – Britain’s MI5 intel service warns terror threat from AQ/ISIS is “unprecedented” w mass casualty attack plotting actively underway. 3000 susp jihadis in UK. 10/26 (Mon) – ISIS affiliated jihadists warn of upcoming release of personal identifying info for, and attacks on, US mil personnel. Caution and incr awareness urged. On multiple occasions this week AlertsUSA subscribers were notified via text messages to their mobile devices regarding increasing threats of terrorism. Starting on Monday, AlertsUSA subscribers were some of the first in the nation to learn of new warnings by ISIS affiliated jihadists of the upcoming release of more personally identifying info for, and threats of attacks on, US military personnel. It is believed the source of the most recent threat is once again, British jihadist Sally Jones (a.k.a. Umm Hussain al-Britani), a western convert to Islam who is reported to have moved to Syria in 2013 and married fellow jihadist Abu Hussain al-Britani, who is reported to have been specifically targeted and killed just two months ago in a U.S. airstrike. Readers are reminded that most recently, in addition to the release of a spreadsheet w/ names, addresses, email credentials and other information for 1400 US service members and government workers, along with a message urging Islamic State followers and supporters to “act and kill” those appearing on the list, she has released personally identifying information for the children of U.S. service members on the hit list, as well as the home addresses of both Robert O’Neil, the Navy Seal who put a few rounds in the head of bin Laden, as well as the Air Force pilot credited with killing U.S. born Muslim cleric and terrorist Anwar Al-Awlaki in Yemen. While it may be easy to dismiss such threats as the ramblings of yet another crazed Islamist hell bent on trying to scare the American and British populace, Jones has been directly implicated in multiple previous attacks and disrupted plots, including the attack on the Draw Mohammad art exhibition in Garland, Texas earlier this year. Further, U.S. intelligence officials have said several ISIS suspects arrested this summer in New York, New Jersey, Boston and several other states are believed to have been influenced by Jones and her husband. Moving next to Thursday of this week, AlertsUSA subscribers were also notified of a new warning issued by Andrew Parker, Director General of Britain’s MI5 internal security service within which he described the terror threat from AQ/ISIS as “unprecedented,” adding that the current level of threat was thehighest he had seen in a career spanning 32-years. Parker went onto say that there is solid intelligence the Islamic State is actively planning mass causality attacks in the UK, and that in the past 12 months his agency has thwarted six terror plots in the UK and another seven abroad. Parker also added that four fifths of his agency’s 4,000 field agents were directed at stopping terrorist attacks. AlertsUSA again cautions readers that despite a seeming lull in successful domestic terror attacks, it is important to realize this is not for lack of trying. There exist dozens of counter terrorism operations constantly underway in the U.S. and Europe, the details of which are rarely paraded before the media. Doing so serves no public, tactical or strategic benefit and actually makes it more difficult for the intelligence, investigative or protective services to operate. We urge readers to not fall into a cynical mindset brought on by the constant drone of internet and coffee house trolls claiming that ISIS is a creation of the CIA and Israel, all terror arrests are setups and that successful terror attacks are false flag operations. Far from it. As an example, on Thursday of this week a 24 year-old New Jersey man, Alaa Saadeh, plead guilty to charges he helped organize a “small army” of ISIS fighters in the Garden State and New York. The second individual to plead guilty in connection with this New Jersey cell, Saadeh admitted giving money and credit cards to other members of the group to try to help them travel to Syria. If members of the group had failed to get to Syria or Iraq on their own, an alternate plan was to buy guns inside the US and target the White House and other landmarks for an attack. In the past year, the FBI has arrested 7 men from New York and New Jersey with ties to just this one terror cell. And lets not forget that just last week, the Director of the FBI stated the bureau has approximately 900 active investigations underway of ISIS operatives across the U.S., as well as the fact that there is no way to screen the thousands of Syrian “refugees” coming to the U.S.
As of the time of this report’s preparation, since 9/11 there have been more than 27,000 separate Islamist terrorist attacks around the world. And this is just one organization’s count of those appearing in open source outlets. Further, only a small fraction of these attacks are categorized as battlefield actions against U.S. or Western soldiers. The majority are incidents like explosive devices tossed into schools and churches, suicide bombings in marketplaces, beheadings, amputations and crucifixions for not observing Islamic law, and so on. Readers are strongly encouraged to be more security minded given the range of threats before us. There are numerous clear, present and growing dangers to the safety and security of yourself and family. AlertsUSA continues to monitor the overall domestic and international threat environment and will immediately notify service subscribers via SMS messages of new alerts, warnings and advisories or any developments which signal a change the overall threat picture for American citizens as events warrant. 10/27 (Tues) – FBI warning law enf nationwide of Halloween plot by anarchist group(s) to ambush police responding to premeditated public disturbances. Vigilance urged. 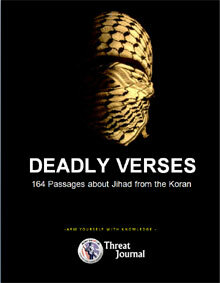 In order to help ground readers in the truth on Islam and enable you to crush liberal “Religion of Peace” arguments, AlertsUSA has compiled two free reports filled with passages from Islamic holy books covering some of the most controversial (and often denied) aspects of Islamic teachings, traditions and dogma. Now you can see them for yourself ! 9/8 – UK Home Office (DHS equiv) publicly warns that ~350 British jihadis have returned from Syria/Iraq w/ active attack plotting underway for the UK, US and AUS. 9/10 – Despite massive security implications, the White House has announced the U.S. will be accepting 10,000+ Syrian refugees in FY2016 (Oct 2015 start). On Monday, AlertsUSA subscribers were notified of an increase in security at federal facilities and transportation hubs in advance of the 14th anniversary of the 9/11 attacks, as well as of new Terror Threat Snapshot from the House Homeland Security Committee detailing the growing threat to America and the West from ISIS and other Islamic terror organizations. There have been more U.S.-based jihadist terror cases in 2015 than in any full year since 9/11. The number of U.S. terrorist cases involving homegrown violent jihadists has gone from 38 in July, 2010 to 124 as of the date of the report’s publication. This is more than a three-fold increase in just five years. As of the end of August, the Islamic State continues to grow and has inspired or directed 57 terror attack plots against Western targets, including 15 in the United States. There have now been nearly twice as many ISIS-linked attack plots against the West this year (37) as there were in all of 2014 (20). Additionally, Islamic terrorists remain intent on killing American law enforcement and military personnel as well as civilians. Readers will recall that last month we reported on the release of another “hit list” of American government personnel, including service members. 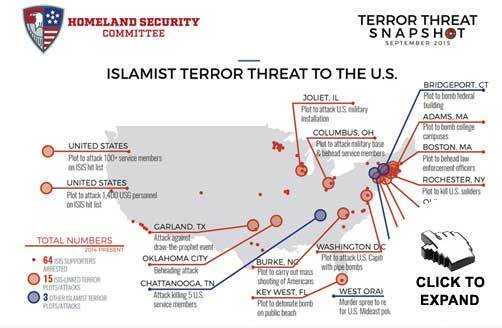 Since early 2014, the majority of Islamist terror plots on U.S. soil have featured plans to kill police or U.S. service members. The report states that foreign fighters continue to swell the ranks of Islamist extremist groups looking to recruit foot soldiers and activate followers to launch attacks in their home countries. On Tuesday, AlertsUSA subscribers were notified of a warning issued by theUK Home Office, the UK’s equivalent to the Department of Homeland Security, within which it was revealed that at least 350 British jihadis are back in the UKafter fighting and plotting terror attacks in the “ISIS-braincell of Syria.” This number accounts for approximately half of the British citizens the government has publicly acknowledged have travelled to the region since the start of the conflict. On Wednesday, AlertsUSA subscribers were some of the first in the nation to learn of the release of the latest issue of Al Qaeda in the Arabian Peninsula’s (AQAP) quarterly publication known as ‘Inspire’. 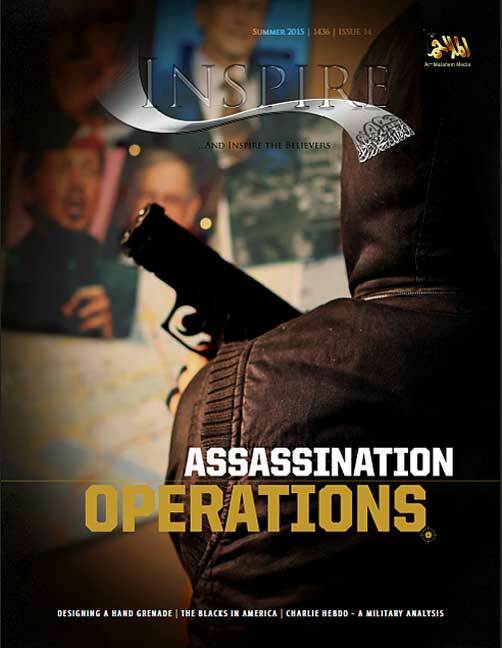 Published around the same time, though not in tandem with, the latest issue of the Islamic State’s Dabiq magazine, this issue of Inspire’s cover story is entitled, “Assassination Operations,” within which guidance is provided on specifying a target, collecting information, generating a plan, preparing for and executing the operation. While readers might be inclined to roll their eyes a such a target list, it is important to note that there is compelling evidence that the Boston Marathon bombers used the publication for guidance on bomb making and target selection. Further, a 2013 issue of the publication carried a similar hit list, within which Stephane Charbonnier, the editor of the French satirical publication Charlie Hebdo was identified as a target. Charbonnier was killed in January of this year when Islamic radicals carried out a raid on the Paris offices of the publication. The target list was republished a few days later via Twitter accounts commonly used for al-Qaeda propaganda with Charbonnier’s name and face X’d out. 8/31 – Law enforcement nationwide on alert following increasing tempo of threats to attack police by New Black Panthers. Increased vigilance and awareness urged. On Monday of this week AlertsUSA subscribers were notified via text messages to their mobile devices regarding a heightened level of alert for law enforcement nationwide following a disturbing increase in the tempo of threats and attacks on police by groups such as the New Black Panthers, members of the Black Lives Matter movement, the Nation of Islam as well as run of the mill lawlessness in our nation’s urban areas. Last Friday, a black man, Shannon Miles, crept up in the dark behind Harris County Deputy Darren Goforth while he was refueling his patrol vehicle and shot him in the head and back fifteen times. Late this week, La Plata, Maryland police arrested a twenty-year old BlackLivesMatter protester for making a threat on Twitter to kill all the white people in the small southern Maryland town. As of the time of this reports preparation, 30 police officers have been killed this year in various forms of attack, including 24 by gunfire, 3 by physical assault and 3 by vehicular assault. AlertsUSA Threat Journal warned of this exact trend back in January of this year. Remember that police form the thin blue line which separates civil society from all manner of lawless animals who wish to do us harm. The net result of the increased threats, killings and demonization of police by elected officials and the media, as well as the resulting pullback of enforcement efforts, is increased crime and danger to the public. While liberal mainstream news organizations intentionally avoid reporting on the dramatic surge in black on white violent crime and black mob violence out of fear of being labeled racist or not being invited to the next correspondent’s dinner, AlertsUSA has no such concerns. We will call out the threats in the greatest level of detail possible in order to help subscribers most effectively manage their risk. Our recommendation in this current climate is simple: When possible, don’t put yourself in a situation of becoming a victim, lock and load, and increase your security awareness. These threats to law enforcement and the safety of the general public are not going away any time soon. In fact, with complete certainty you can assure yourself they will be increasing, not decreasing. AlertsUSA continues to monitor developments in this area and will immediately notify service subscribers of new threats, warnings and advisories or any developments which signal a change the overall threat picture for American citizens as events warrant. 9/3 – USGOV issues travel warning for Turkey due to terror threat resulting from start of anti-ISIS mil ops from Incirlik Air Base. Caution urged for US citizens. 9/2 – Security incr at transport hubs, critical infrastructure & major event sites nationwide in run up to holiday weekend. Vigilance & security awareness urged. AlertsUSA Threat Journal subscribers will recall that in February of this year we warned of a threat by the Islamic State to send hundreds of thousands of migrants to Europe as a ‘psychological weapon’, along with the bold statement, “We will conquer Rome.” At that time, the threat raised alarms with Italian authorities to such an extent that the Italian government deployed ~5000 soldiers around Rome and elsewhere in the country to protect sensitive sites.Fast forward to this week and we can see that the Islamic State threat is holding true. On a daily basis, thousands of illegal immigrants from across the Middle East and the Northern half of Africa are arriving on the shores of Mediterranean nations such as Greece, Albania, Italy, France and Spain, the majority of whom then work their way north into wealthier countries such as Austria, the Czech Republic, the Netherlands, Germany and others. Why is this of importance to AlertsUSA subscribers? This mass migration of Muslim immigrants from the Middle East and North Africa poses an extraordinary security threat. In February, the Turkish intelligence service warned police in an internal memo that up to 3,000 trained jihadists are seeking to cross into Turkey from Syria and Iraq, who could then travel through Bulgaria and Hungry into Western Europe. And in May, a Libyan government adviser warned Islamic State operatives were being “smuggled to Europe in migrant boats.” Also in May, Nowegian authorities arrested a large group of Islamic State and Al-Nusra Front terrorists masquerading as “refugees” and using fake passports. This week, Bulgarian authorities arrested the five men who, after attempting to bribe a border guard, we found to be in possession of Islamic State propaganda, specific Jihadists prayers, decapitation videos and other unspecified materials that turned this from a simple police matter into an incident involving the Bulgarian State Agency for National Security. The net result will be an likely be an increasing tempo of terror attacks such as the incident with the Muslim gunman on an Amsterdam-Paris express just two weeks ago, to the attack on the U.S. owned chemical supplier south of Paris approximately 8 weeks ago by a Muslim immigrant from N. Africa (also see this) to the ongoing Muslim crime wave sweeping Scandinavia, etc..
And lets not forget: Muhammed Youssef Abdulazees, the gunman who attacked the U.S. Navy Reserve center in Chattanooga killing 6 and injured 2 was an immgrant from Kuwait. The simple fact remains that core societal values and religious differences (most of which are irreconcilable) exist between western culture and Islam. As is being seen all too often in such places as France, Britain, the Netherlands, Belgium and a growing number of cities in America, Muslim enclaves are established with little or no assimilation. Instead, the host country is pressured to change or accomodate the new arrivals. Further, given the core foundations of the Islamic faith (see the free reports below), it is impossible to know who amongst the immigrants is a present or future jihadist, who may want to impose sharia (Islamic) law, or worse.